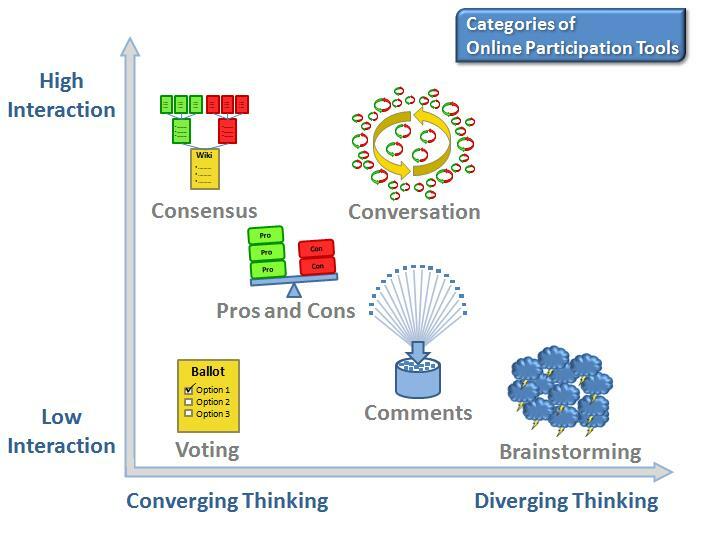 Evolving Beyond Two-Way Dialogue | AthenaBridge | Intelligence, connected. This article is written for non-profit organizations and government agencies that are having difficulty transitioning from a broadcast model of communication to one that is participatory and engaging. Your organization is probably better at organizing its members and its public rather than empowering them, and that’s understandable– after all, that model has been successful for a long time! But culture change is running deep and wide across our economy; entire industries are being reshaped by the decentralized nature of the Internet. These trends reveal an opportunity for you to connect with the public and authentically empower them as partners in solving the problems that your organization set out to solve. There are three generations of organizational communications: one-to-many, two-way, and many-to-many. If your organization has resisted the trend toward two-way dialogue of recent years and currently uses a one-to-many model, there’s still time for it to catch up and perhaps even leap ahead of its peers. Just as many developing nations skipped the era of land line telephones and jumped straight to mobile technology, your organization can skip the growing pains associated with two-way dialogue and ease right into a more resilient, networked model of many-to-many communication. One-to-many communication includes TV ads, speeches, and brochures. Two-way dialogue includes Facebook pages with limited discussion capabilities. Many-to-many communication involves large conversations with advanced forum software, just one of which is AthenaBridge. It’s easier (and more cost-effective) for your organization to listen to 500 people converse with each other than it is to respond to 500 individual emails. After listening, you can engage your network with the benefit of learning where they stand and hearing what they are prepared to do to help you. After all, every person you hire to respond to emails and Twitter messages is a person you could have hired to help you directly with your mission. However by effectively tapping the network, your communications staff can create a disproportionately large and positive impact on your mission. Many-to-many communication empowers your network to embrace your mission on a deeper level; it’s easy to forget that you are not alone– the public, your public, cares. Members of your public are eager to help you accomplish your mission at their local level while these large conversations help you flex your network and prepare for focused and synchronized action at the national level. As more people engage, the value of the conversation increases while your workload does not. Larger audiences provide balance and serve as more resilient filters and quality control. More often than we’d like to see, non-profit organizations are afraid to lose control. They fear that if they empower their members to speak, then the ensuing conversation will reveal internal divisions. Solution: This shouldn’t hold you back; a diversity of opinion makes your organization more resilient and relevant by injecting vital ideas into your decision-making cycle. Healthy discussion is essential. Government agencies and non-profits are understaffed and are not enthusiastic about handling waves of public comments. Solution: Rather than relying on a channel for two-way communication and collecting isolated and conflicting comments that your staff will have to process, enable a conversation among your network. It’s far easier to take a listening role, have your network sort out their disagreements, and filter out the best ideas for you. Once you’re at this stage, you will know exactly how to reach and inspire them to action. Trust your public. Harness the best of their energy and expertise. Stay engaged and curate the conversation. A little structure and guidance up front can provide significant returns on investment down the road. Demonstrate that you’re eager to learn and not afraid to innovate. We don’t pretend to have all the answers, but the trends are becoming increasingly clear: the transformative organizations of the next decade will embrace a networked model of openness and mass collaboration. You may also be interested in these other articles about the AthenaBridge Philosophy. This entry was posted on February 24, 2010 at 11:35 pm and is filed under Public Engagment, Townhall meetings. You can follow any responses to this entry through the RSS 2.0 feed. You can leave a response, or trackback from your own site.